A Condo Vacation for less than the price of a hotel room. 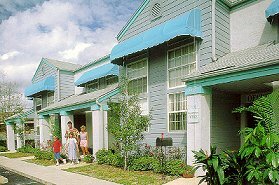 The Resort is conveniently located within 5-15 Minutes of Central Florida Attractions, including WALT DISNEY WORLD Resort, Universal Studios and Sea World. Orlando International Airport, Orange County and Tupperware Convention Centers are close by. Just an hour away is Tampa's Busch Gardens, Kennedy Space Center and the Beaches of Florida's East and West Coasts. As an added convenience, Summerfield Condo Resort sells Major Attraction and Dinner Theater Admission Tickets in the office.